This is 3.5 inch Floppy Drive Emulator (Floppy to USB Converter). It is the replacement for almost of 3.5 inch floppy drive which works on fully formatted capacity of floppy disk. *** Package include one preformatted 2gb Pen Drive Ready to start working. Tajima: TMFD, TFKN ,TFGN, TME-DC, TEHX, TMEX, TMKD, TMLH, TMCE,STKN,TFGN, SWF./Happy: HMF, HCM, HCA, etc. Please do let us know if you are buying for any other model that is not listed. PC running Windows XP/ Windows 7 system to run our program to format USB flash drive. Please do not leave a -ve Feedback , as it never resolves any issues. Please send a simple mail/communication to us to give us chance to resolve ANY ANY ANY issues. Floppy to usb emulator with 1:1 size as floppy drive. It with IDC34pin+4P power plug (Standard interface). It is used for replace the old floppy drive to USB pen drive. 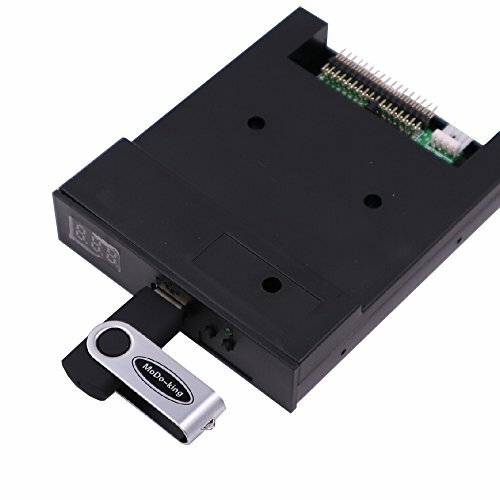 Floppy to usb emulator to offer a good solution for all Device currently used a standard floppy drive, just install floppy to usb emulator to replace floppy drive at the original position, you can store and transfer data via USB flash stick. CE & ROHS certificate is available. Manufacturer: SHENZHEN MODO TECHNOLOGY CO,.LTD. Publisher: SHENZHEN MODO TECHNOLOGY CO,.LTD. Studio: SHENZHEN MODO TECHNOLOGY CO,.LTD. If you have any questions about this product by MoDo-king, contact us by completing and submitting the form below. If you are looking for a specif part number, please include it with your message.